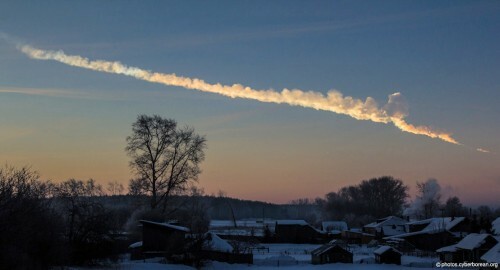 Image Credit: Photograph taken from a distance of about 200km from the Chelyabinsk impact site in the minute following the atmospheric explosion. On the morning of the 15th of February 2013 at about 09:20 local time, the sky above the Russian town of Chelyabinsk – nearly 2000km east of Moscow and just north of the border with Kazakhstan – was rent asunder by a bright flash of light and shockwave of sound. There had been a huge explosion at an altitude of about 76,000 feet and on a scale of about 20-30 times that of the nuclear fission bomb that was exploded over Hiroshima in 1945. A superbolide with a mass of between 12,000 and 13,000 metric tonnes (about 20m in diameter) had grazed the Earth with a speed of nearly 20km/second. Fortunately it had disintegrated high in the atmosphere and this limited the damage on the ground to around 1,500 human injuries and 7,200 damaged buildings in six cities in the region. By a remarkable coincidence there was a prediction that a larger asteroid, discovered a year earlier and around 45m in diameter, known as 2012 DA14, would pass the Earth at a distance of only 28,000 km – within the orbit of the geosynchronous satellites – at 19:25 GMT on the same day. By yet another coincidence, these events were occurring while the United Nations Committee on the Peaceful Uses of Outer Space (UNCOPUOS) was holding a meeting of its Scientific and Technical Subcommittee in Vienna. In 2001, UNCOPUOS had established an Action Team (AT-14) to investigate the potential hazards of Near Earth Objects (NEO) and make recommendations to the UN regarding the improvement of the knowledge of potentially hazardous NEOs and the possibilities for the mitigation of their harmful effects. During this meeting in Vienna, AT-14 was presenting its final report and recommendations. What could AT-14 actually achieve and what was beyond its reach? We already have a clue from the events of the 15th of February. We knew about the approach and passing of DA14 – it was discovered by a Spanish observatory a year before – but the Chelyabinsk impact caught the world entirely unawares. Why was that? Principally because DA14 is 45m and Chelyabinsk was 20m in diameter and it is easier to find big asteroids than small ones. The surveys are more successful for big, light-coloured rocks than for small, sooty ones because they are generally brighter and can be seen at greater distances. It also depends on the nature of the orbit since asteroids inside the orbit of the Earth around the Sun are harder to detect than those outside. This is partly because the Sun will ‘blind’ telescopes looking towards its part of the sky more than those looking outwards into the Solar System, and partly because objects appearing in the part of the sky around the Sun often will be seen as thin crescents like the New Moon and so be very faint. Chelyabinsk was small and it came to us ‘out of the Sun’. The teams around the world that run general asteroid and specific NEO surveys have built up statistical estimates of the fraction of potentially hazardous objects as a function of their size. We currently know of 861 NEOs with diameters of greater than 1km and this catalogue is estimated to be about 90% complete. These are the real potential killers: the one that is supposed to have killed off the dinosaurs about 65 million years ago by impacting the Yucatán peninsula is thought to have been about 10km across. This caused an explosion about 20 million times that of the largest nuclear bomb ever constructed. There are thought to be about 15,000 NEOs larger than 140m but only about 39% of those are known. These would do a significant amount of damage over a large area but would probably not precipitate a mass extinction. The AT-14 members are working hard to complete the catalogue of these objects. Once we get down to objects bigger than 40m (the estimated size of the 1908 Tunguska impactor in Siberia – the Russians suffer because of their huge land area! ), there are estimated to be around 300,000, but we only know about 3% of those. All in all there is a lot of cataloguing to do, but specially constructed satellites will help here; especially if they orbit the Sun at about the distance of Venus where they can look out towards the Earth and beyond. What if a NEO is found with an orbit that may intersect the Earth in the foreseeable future? If it is found within a few decades of likely impact and the orbit is refined to provide sufficiently high certainty of such an event, mitigation efforts need to start straight away. One of the first things to do is to determine the orbital parameters with sufficient accuracy to firm up the actual location and time of impact. This can be achieved by high precision astrometric observations with telescopes on the ground and in space. If necessary, a space mission could be flown to attach a radio transponder to the object which could then be tracked for as long as necessary, also determining its physical properties such as size, mass, density, cohesive strength etc. We would now know when and where our supposed asteroid will hit and have a pretty good idea of how much damage it might do over what kind of area. This is now getting serious and we have to look carefully at our options. This may be an engineering problem: we could deflect the asteroid so it will miss the Earth. If we can’t do this – perhaps it is too big to move or we don’t have enough time – it becomes a question of information dissemination and, inevitably, a political problem. We may have to evacuate a country or even a continent. This is why our Action Team is working under the auspices of the United Nations and why our report eventually goes to the Security Council. This would need to be handled above the level of national politics. How do we deflect an asteroid? This is not an easy task, especially if the object is bigger than around 100m. It depends on the nature of the object: is it a solid piece of rock or is it what we call a ‘rubble pile’? This really makes a difference. You probably imagine launching a huge ‘nuke’ and blasting the thing to smithereens or possibly that just nudging it sideways might do the trick. Apart from the fact that the UN is somewhat averse to the idea of nukes in space, this may not be the best thing to do since it could generate a swarm of killer objects in place of a single large one. For a coherent, solid rock, it might be that a carefully targeted kinetic impact by a high-speed and heavy spacecraft would produce a sufficient orbital change – especially if it was carried out decades before Earth impact when you may only need a velocity change of about 1cm per second. A method that is somewhat more elegant and predictable is to use something called a ‘gravity tractor’ (yes, you probably heard it on Star Trek). To do this you fly a massive (as possible) spacecraft closely alongside the asteroid. They will be attracted towards one another by gravity. To avoid a collision when they get too close, you move the spacecraft a little bit away from the asteroid so it is always close but not touching. The spacecraft gets deflected a lot more than the massive rock of course but, given time and patience you get what you calculated: a small but sufficient change in the asteroid’s orbit. Another promising possibility is to attach a solar-power driven ion drive to provide a long-lasting low thrust to change the orbit in a suitable direction. Our capability to do these things will presumably grow with time but, right now, we could probably move an asteroid of 140m enough in about two decades. Such strategies have been assessed by a group of astronauts called the Association of Space Explorers (http://www.space-explorers.org/), several members of which (including the Apollo astronaut Rusty Schweickart) are not only part of AT-14 but have been active drivers of the whole process in the UN. This is about where we are now. As well as NASA and a number of dedicated asteroid survey observatories around the world, other groups are working on various aspects of the problem. AT-14 has recommended welding these groups into more coherent structures for warning of impacts and planning impact mitigation missions. They have also given thought to the public relations issues that will inevitably need careful handling to avoid panicked reactions. The European Space Agency (ESA) has a ‘Space Situational Awareness’ programme (http://www.esa.int/Our_Activities/Operations/Space_Situational_Awareness/Near-Earth_Objects_-_NEO_Segment) that includes NEO studies. Also the European Southern Observatory (ESO) now has, at my suggestion, established an ‘expert group’ who can help to plan precise observations of faint asteroids when critically necessary for refining orbits and assessing physical properties such as albedos and sizes. The team is already active and has three objects in the queue for astrometric measurements. There are two substantial asteroids that we know will pass close to Earth between now and 2040 but, at the moment, it appears unlikely that they will actually hit. I should like to thank all the members of AT-14 for the interesting and fruitful discussion I have been party to. I should especially like to mention Karel van der Hucht of the International Astronomical Union who has willingly made available his wealth of knowledge of the subject and for his work on the IAU Near-Earth Asteroid website: www.iau.org/public/nea/ . Olivier Hainaut at ESO has been my asteroid mentor and I happily acknowledge many delightful discussions with him.